Veligandu’s main restaurant, Dhonveli, features all-you-can-eat buffet style meals and is open daily for breakfast, lunch, and dinner. This outlet offers an abundance of international and local specialities to please even the most discerning of tastes. 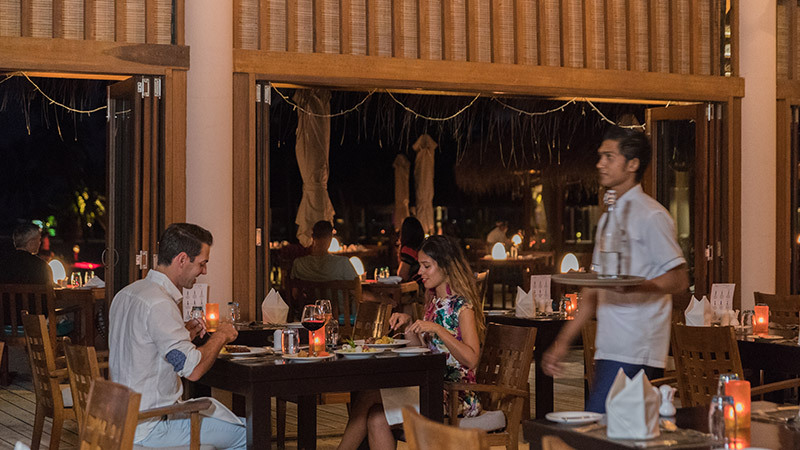 Select the dishes of your choice for a truly unforgettable dining experience while in the Maldives. In addition to the selection of fresh salads, themed main dishes and tropical fruits, the buffet line-up also includes homemade breads, soup of the day and scrumptious desserts. Try out the live-action cooking stations – our talented team of chefs are ready to tailor-make a piping hot dish to your order, just the way you like it. The restaurant was designed as a more traditional open air style venue and is divided into three separate dining areas. This allows for a relaxed, toes-in-the-sand atmosphere under the authentic Maldivian thatched roof. Seating is also available outdoors, on the wooden deck. Your personal waiter will seat you at a table of your preference and will attentively, yet discreetly oversee your dining experience throughout the whole meal, ensuring you enjoy yourself to the fullest. On Friday evenings, Dhonveli proudly presents a themed dining evening with a local twist, Maldivian Night. This indulgent traditional evening showcases mouth-watering Maldivian flavours to choose from. Guests are invited to taste the tempting themed menu, while the waiters contribute to the authentic ambience in traditional Maldivian attire. Breakfast on Wednesdays and Sundays features a complimentary glass of bubbly to accompany your breakfast. Toast to the day ahead and the many possibilities of your island holiday. Dress code is very casual, we encourage barefoot dining. While bathing suits may be worn for breakfast and lunch the approprite cover-up or sarong (for the ladies) and a short sleeved (not sleeveless) polo shirt (for the gentlemen) must be worn in the restaurant.